The Student’s Book is divided into 4 folders. Each folder is subdivided into 3 units. Two double page spreads of Input: Lexis/ functions. The Unit opens with a large photograph and the first language input consists of a dialogue (or more frequently a reading passage in the second and third volume). In this section one or two of the unit’s functions are presented along with some elements of vocabulary. In the pages that follow, work is done on the lexis and functions, and concludes with a personalised activity where the students can try out their new language. The second double page spread follows the same layout as the first, but offers a greater quantity of exercises as well as a pronunciation activity. The workbook contains a section that corresponds to the lexis and functions of the two units. The double page spread of grammar in the Student’s Book guides the student towards discovering and constructing the rules before putting them into practice straight away with functional exercises. From these pages, the students can move on to the Workbook for further practice and, having exhausted the subject, follow the directions to the Personal Toolkit Grammar for consultation of the valid rule and to complete further consolidation exercises. A double page “fun” spread, rich with ideas for discovering the reality of the English speaking world and come closer to authentic language. At the end of each folder the Check Your Progress pages contain language revision exercises which enables the student to take stock of their progress and prepare themselves for the end of unit test. A double page spread which follows a gradual path of skills with varied and authentic activities. From the outset the students become familiar with exercises in the style of the KET and Trinity exams. A double page spread, rich with reading and activities, that offers its own separate didactic path to explore subjects other than the English language. Further activity and reading sheets are to be found in the Tests and Resources book. Four themes of a more traditional nature which pay special attention to cultural comparisons. Each section contains reading passages and activities. This is a self contained section and offers more flexibility to the teacher who is free to choose “if and when” to insert it into the programme. 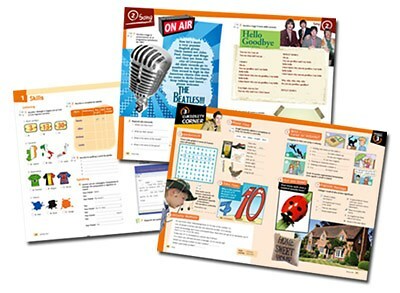 More activity sheets are to be found in the Tests and Resources book. The Student's book includes a reader Home Run + CD audio from the series Teen Beat to develop reading and listening skills. The website www.teenbeat.cc contains lots of extra games, activities and informations on the stories plus a Teacher's Resource Centre with lots of practical ideas and suggestions on using the books in class. Visit www.teamupinenglish.com for further information.